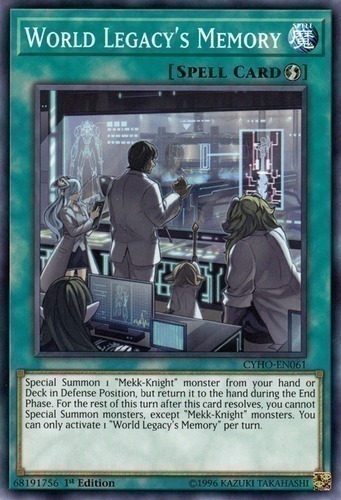 Text Special Summon 1 "Mekk-Knight" monster from your hand or Deck in Defense Position, but return it to the hand during the End Phase. For the rest of this turn after this card resolves, you cannot Special Summon monsters, except "Mekk-Knight" monsters. You can only activate 1 "World Legacy's Memory" per turn.